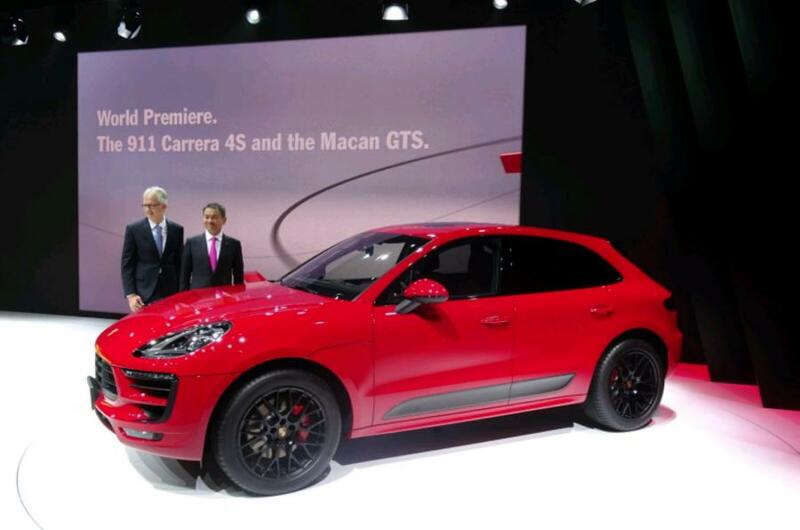 New Porsche 911 range and Macan GTS at Qatar Motor Show 2016! A showcase of Porsche’s performance evolution will exemplify the brand’s pioneering steps into the future at the 2016 Qatar Motor Show (QMS). Taking place at the Doha Exhibition and Convention Centre (DECC), a range of new Porsche models will celebrate their regional debuts. Amongst them will be the 911 Carrera 4S, 911 Targa 4S and the all new Macan GTS. In follow up to its world premiere at the 2016 edition of the North American International Auto Show in Detroit, Porsche will also bring the new 911 Turbo S to Qatar for its regional debut. Similar to previous years, Porsche will use the Doha event as a platform for introducing its latest models to the region, with 2016 being no exception. The 911 has been the world's best-selling sports car for decades and now new turbo as well as all-wheel drive versions of Porsche’s iconic sports car will be showcased in the Middle East for the first time. Embodying the perfect balance of Porsche performance and driving dynamics, the new 911 models are well equipped to continue the Stuttgart-based manufacturer’s reign as segment leader in two-door sports cars. Meanwhile, the all-new Macan GTS provides driving experiences that surpass those which have become customary with the sporty Macan. Porsche will celebrate the latest derivative of its compact SUV at Qatar Motor Show and like all Porsche variants that bear the three-letter insignia, the Macan GTS is inspired by motor racing. The new 911 Turbo S leads Porsche’s plan to premiere three 911 model derivatives at one motorshow. As the top athlete in the range, with an output of 580 hp, the 911 Turbo S is a high-performance sports car through and through. The latest iteration of the model achieves breath-taking driving performance, whilst reducing fuel consumption further, when compared to its predecessor. The coupe version of the model sprints to 100 km/h in 2.9 seconds, with a top speed of 330 km/h, which is 12 km/h higher than before. All-wheel drive versions of Porsche’s iconic 911 models will also take centre stage in Qatar with the premiere of both the 911 Carrera 4S and 911 Targa 4S. Both models are a representation of how Porsche is evolving the sports car. Thanks to more than four decades of experience with turbo engines – in both motor racing and production sports cars – the completely new engine generation with bi-turbo charging featured in both models, raise the emotional driving pleasure to an even more intense level. An increase of 20 hp across all models amounts to a total of 420 hp in the 911 Carrera 4S Cabriolet and 911 Targa 4S. When equipped with PDK and Sport Chrono Package, both the 911 Carrera 4S Cabriolet and 911 Targa 4S boast a zero to 100 km/h improvement of 0.3 seconds on previous models; sprinting to the speed in just 4.0 seconds. In line with its unique history and iconic character that has remained authentic for more than 50 years, a range of exterior features have been refined. Enthusiasts can differentiate the new 911 Carrera models from their predecessor by the new headlights with four-point daytime running lights, the redesigned rear lid with vertical louvres and the new rear lights, featuring the distinctive four-point brake lights. Meanwhile, the interior now features the updated Porsche Communication Management (PCM) system with multi-touch display, offering a considerably expanded range of functions and intuitive controls. Embodying the same motorsport bloodline as that of the 911, the new Macan GTS offers even more driving fun as the sports car among compact SUVs. Boasting an output of 360 hp the Macan GTS places in-between the Macan S and the Macan Turbo with a three-litre V6 bi-turbo engine accompanied by the Porsche Doppelkupplung (PDK) and Porsche Traction Management (PTM) with flexible power distribution between front and rear axles. Completing the zero to 100 km/h sprint in 5.0 seconds with the optional Sport Chrono package, the Macan GTS has a top speed of 256 km/h. The GTS version of Porsche’s compact SUV combines a high level of driving dynamics with outstanding everyday utility. It can be recognised at first glance thanks to a range of exterior accents finished in black, this includes high gloss in the upper and matt finish in the lower areas of the car, as well as GTS-specific colouring, that comes as standard. Porsche brings the future of the sports car to life in to Qatar, with the new 911 Turbo S, 911 Carrera 4S and 911 Targa 4S as well as the new Macan GTS on display at the Doha Exhibition and Convention Centre from January 27th to February 1st 2016. Gabriel Abou Adal & Co s.a.l. ¬© wheelers.me All rights are reserved. we send great deals and the latest auto news to our subscribed users every week!